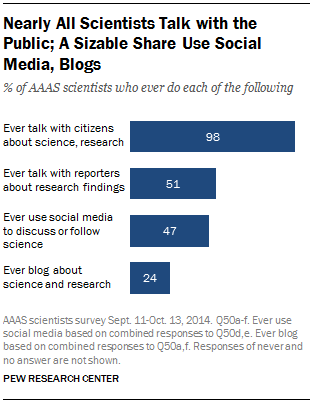 Scientists frequently use social media and engage with journalists, policy-makers, and the public. At the same time, many people have a thirst for reliable cutting-edge results on the latest scientific findings and on pressing questions such as responses to the Ebola crisis, climate change, and the drought in California. However, scientists themselves do not sufficiently value public outreach and policy advocacy among their peers. And the pressures of competition and the fast-paced news cycle can distort the scientific messages that reach people. That’s the good news; now for the bad news. 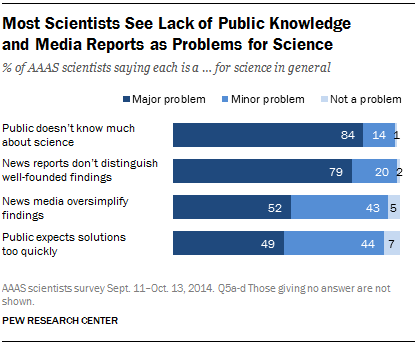 The majority of scientists believe that the limited public knowledge about science and the fact that the public expects solutions too quickly are major problems. Furthermore, although scientists interact with reporters, many criticize news media: they believe that news reports oversimplify findings and don’t distinguish well-founded findings, and they believe that this too is a problem for science. In addition, many scientists surveyed do not think that the best scientific information is used for crafting policies, such as those involving clean air and water, food safety, and medical treatments. Here’s where we transition from the survey results to my opinions about their implications.. Many people love science and they can’t get enough of it. In my field of astrophysics, I see people inspired by stories about the comet landing, theories about black holes, and observations of galaxies colliding with each other. People consume science news on newspapers like the LA Times, magazines, websites, blogs, television, podcasts, videos, and elsewhere. People want to know the latest science on important subjects, especially those that could directly affect them, including health and environmental issues. If, say, a psychologist at UCLA, an astrophysicist at Jet Propulsion Laboratory, or a climate scientist at the Scripps Institution of Oceanography has an exciting new result, they would like to advertise it and people would be interested in hearing about it. Politicians also want to hear about the most up-to-date science when they develop new policies and regulations and when they determine budgets for relevant agencies and initiatives. Science journalists and advocates attempt to fulfill these demands by communicating research on fields from astronomy and biology to psychology and sociology, but it’s often not easy. Some aspects of the scientific process itself complicate the situation. When presenting scientific research, it can be difficult to communicate the context of a contentious question, the assumptions of an analysis, and the statistical and systematic uncertainties that might be involved. One may describe competing scientists’ interpretations, but then one must be careful about creating a false equivalency between them if an interpretation is more well-founded than another. Moreover, excitement over the announcement of a potentially groundbreaking result, such as neutrinos supposedly traveling faster than the speed of light, is often not sustained for long, which is problematic if the result is later retracted. In addition, debates between scientists, such as the recent one about the expansion of the early universe based on results from BICEP2 and the Planck telescope, may take years or even decades to resolve. Scientists compete to get their new results out first, and media outlets compete to get the story out first. In this situation, it can be difficult to communicate nuance and subtlety. Scientific research isn’t of much use to anyone if no one effectively communicates it and its implications. We should encourage science journalists to take the time necessary to investigate and clearly communicate relevant information in plain language, and when we read or watch those stories, we should try to pay attention to the important caveats. It’s great to get excited about each new science story and discovery, but we would all benefit from a bit of caution and patience.